This simple NBA T Shirt will show off what team you cheer for on gameday with its front screened Celtics graphic which lets everyone know you’re a Boston Celtics fan. Made in a Mens cut this short sleeve t shirt comes in black with a regular fit body made from 100% Cotton that should give you seasons of wear. OFFICIALLY LICENSED: Team Graphics and colors are licensed by the respective team and league and are printed high quality logos. Every Shirt comes with a licensed tag to ensure that this is Authentic Majestic Athletics and NBA clothing. 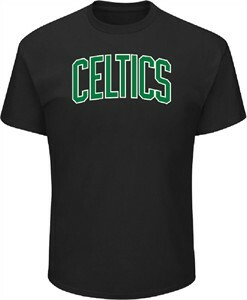 MACHINE WASHABLE MATERIAL: This Celtics Mens NBA T Shirt is constructed from 100% 5.2 Oz Cotton material that comes with a Standard fit body that works great as an all-purpose shirt . SCREEN PRINTED TEAM GRAPHICS: Since this shirt is madeby Majestic it follows stringent quality guidelines so the team logos should give your season after season of wear so you can stand out at a NBA game. SHOW YOUR TEAM SPIRIT: This Short Sleeve Tee Shirt makes a great gift for any Boston Celtics fan you may know so they can show up on Game Day and there will be no mistake which NBA team they cheer for.